The summer before second grade, I was obsessed with Hanson. I remember my mom telling me I should start listening to more music and that I would like the Hanson brothers. 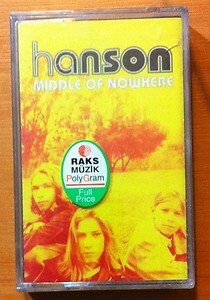 She bought me a cassette tape, my first tape I ever owned, of their junior album Middle of Nowhere. I loved how orange and yellow the cover was and thought it was cool that the brothers each had long hair. She also bought me a T-Shirt. It was grey and featured all three of them each with a somber look on their faces. I would put on my Hanson shirt, proudly reppin' my boys Zac, Taylor and Isaac, and pop my cassette into my portable Sony Walkman. I'd sit on my deck in my backyard, mouthing the words to MMMBop, Thinking of You, and, my favorite, Man from Milwaukee. I made up choreography to each song and forced my mom watch me perform for hours. As far as I was concerned, I was Hanson's biggest fan. I couldn't wait for start school and to show off my cool, new threads and jams. Sometime during the first week of second grade, I wore my Hanson shirt to school. Unfortunately, this would be the last time I would wear it. Unbenounced to me, it wasn't cool to like Hanson. You either liked Backstreet Boys or 'N Sync. There was no in between. And there certainly was no liking Hanson. I quickly let the peer pressure get to me and stopped wearing my Hanson shirt, and I traded Middle of Nowhere for *NSYNC and Backstreet's Back. I didn't listen to Hanson again until high school (SPOILER: I adore them now). I think about that day in second grade a lot. And when I do, I always think about how I should have stood up for myself. I should not have cared that Lisa thought Isaac was ugly or that Jessica wrote "Hanson smells!!!!" on my wide-ruled, red notebook. I should have listened to Hanson because I wanted to listen to Hanson. I guess that's something you learn as your get older - to do things for yourself, not because other people think you should or shouldn't. The person you are, and the person you will become, should be molded out of the clay of your own brain, not the play doh of others. This isn't to say that you shouldn't listen to other people or take their advice and suggestions, but overall, you should make decisions for yourself. Listen to the music you want to listen to. Read the books you want to read. Watch the movies you want to watch. Love the bands you want to love. Had I known that in second grade, my last name might be Hanson by now.